The India U-15 side is all set for its travel to Johannesburg, South Africa, where the team will take part in the Future Champions 2019 tournament. 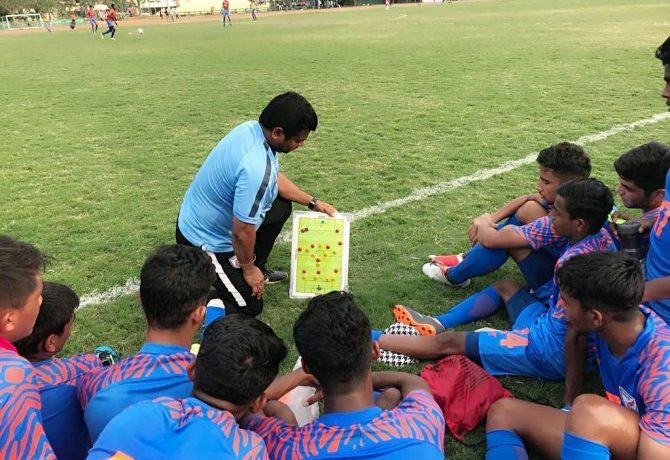 Ahead of their departure to the African continent, India U-15 boys team Head Coach Shuvendu Panda stressed on the coaching staff’s effort to harness the players’ strengths. India are up against some tough opponents in South Africa, the most illustrious of them being the RCD Espanyol U-15 team from Spain. “Yes, playing against a team like them is always very demanding and challenging, but we have analysed a lot of things and prepared accordingly,” Panda said. “Keeping an eye on this and other upcoming demanding games, we created similar situation for our players and played a couple of matches with higher age group teams like Indian Arrows, U18 Tata Football Academy, Odisha Santosh Trophy team respectively,” he further stated. The India U-15 side has had a long preparatory build-up in Bhubaneswar, Odisha, ahead of this crucial tournament, and Panda marvelled at the state-of-the-art facilities provided by the Odisha Government. “A big thank you to the Odisha state government for providing us with state of the art facilities which has helped to nurture the youth teams. From theground, to the sports science centre, gym, swimming pool, etc. , every facility at the Kalinga Stadium is top notch and it has helped create a sense among the boys that they are being taken care of in the best possible way, and are part of something big and important,” he said. India have been clubbed with SAFA Gauteng and RCD Espanyol in Group D. They kick-off the tournament with a match against NPFL All Stars, before facing the other two teams in their group. The top teams from each group make it to the semifinals, while the rest go into 5th to 12th place classification playoffs.